Let me back it up a bit. Aforementioned eating buddy recently had a bridal shower, which I assisted in planning. We thought the black and white would be a great wedding favor, as it was one of her faves and black and whites are quintessential NYC. Now the question was – which size? Price was not an issue, as a regular is $2, a mini is $1 and we would either give one regular or two minis per guest. The mini was slightly preferred, to make for easier packaging, but I needed to make sure the taste was up to par. First, some measurements. The regular measured in at a good 5 inch diameter, while the mini was approximately 2.5 inches. If you remember back to middle school geometry, twice the diameter equals MORE than twice the eating area. So really, the big cookie was a much better value. I then split each cookie in half, so that my eating buddy and I could each sample both. The large cookie had a softer and slightly fudgier chocolate section, while the frosting on the mini was almost a little crisp. Additionally, the large cookie was a little moister in the middle. The mini was slightly crumbly. Taste-wise, they were comparable. Wanting to confirm our thoughts, we sampled some more. In the end, I concluded that if you had a choice, I would definitely recommend the large cookie. The moisture content, texture and frosting composition are just better. However, purely for aesthetics and the “cute” factor (if that’s what you’re looking for), the mini is a winner. In the end, we went with the mini, but my heart will always belong to the regular. was that comment not thoughtful enough? i like the idea of mini b&w's but i do agree that the the true black and white cookie-ness is better achieved through the bigger cookie. something about the crunch of the icing w/the soft cakey middle. I love the scientific review! 🙂 I so wanted BW cookies last year for my wedding. I wish I had found these. Oh well! You are so cute!! Love the experiment. These things are important!! i love that when you first cut them, they look like big daddy pac man and little tyke pac boy. 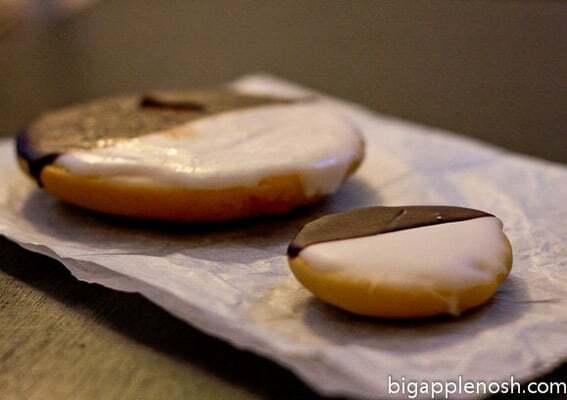 i love a good black and white cookie. I love myself some good food :). Your blog definitely makes me hungry each time I visit. I love black and white cookies, I tend to love the larger ones because of the cake-like texture.